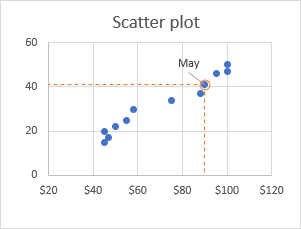 The tutorial shows how to identify, highlight and label a specific data point in a scatter chart as well as how to define its position on the x and y axes. Now, you want to be able to quickly find the data point for a particular month. If we had fewer points, we could simply label each point by name. But our scatter graph has quite a lot of points and the labels would only clutter it. So, we need to figure out a way to find, highlight and, optionally, label only a specific data point. Enter the point's text label in a separate cell. In our case, let it be the month of May in cell E2. It is important that you enter the label exactly as it appears in your source table. 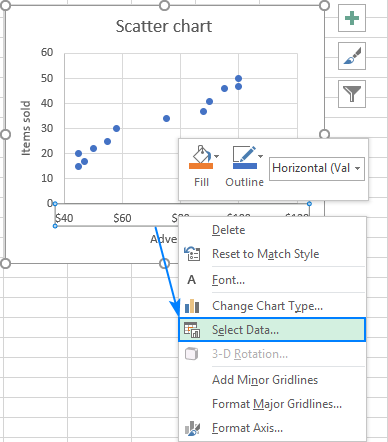 Right-click any axis in your chart and click Select Data…. 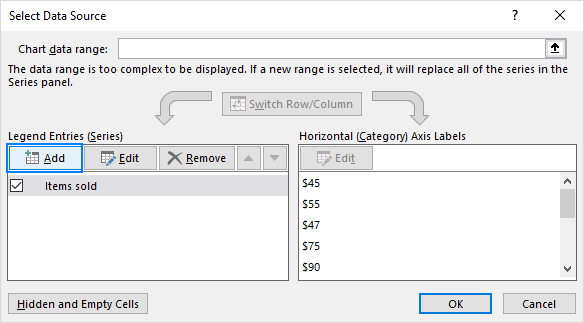 In the Select Data Source dialogue box, click the Add button. Enter a meaningful name in the Series name box, e.g. Target Month. 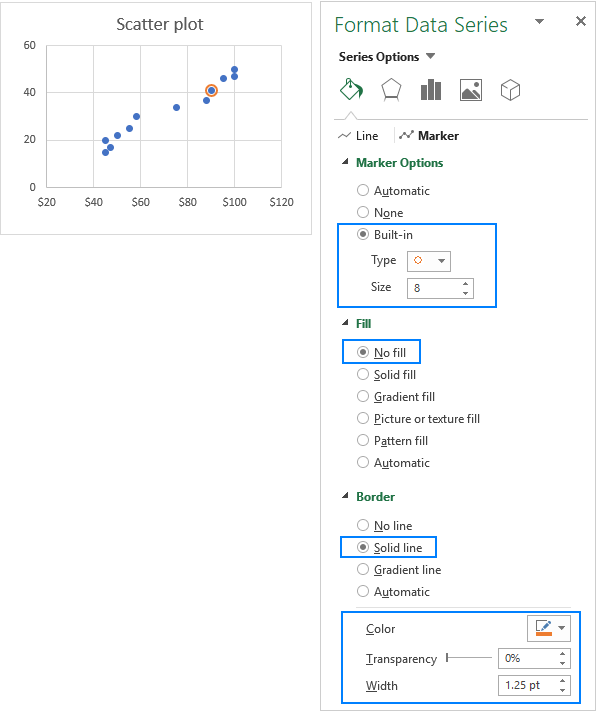 As the Series X value, select the independent variable for your data point. In this example, it's G2 (advertising cost). As the Series Y value, select the dependent In our case, it's F2 (items sold). 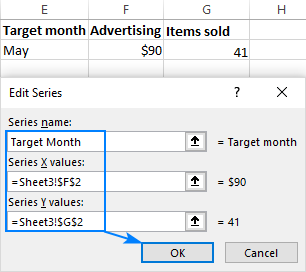 Of course, since the chart series update automatically, the highlighted point will change once you type a different name in the Target Month cell (E2). There are a whole lot of customizations that you can make to the highlighted data point. I will share just a couple of my favorite tips and let you play with other formatting options on your own. 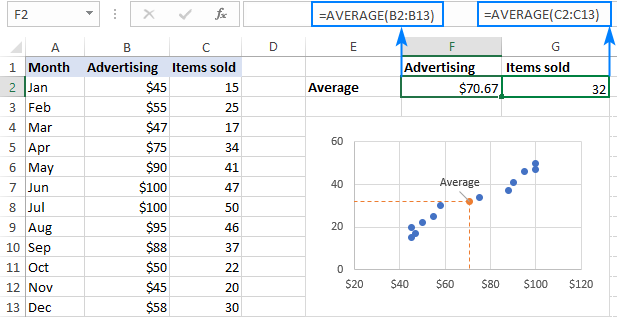 Click on the highlighted data point to select it. Click the Chart Elements button. 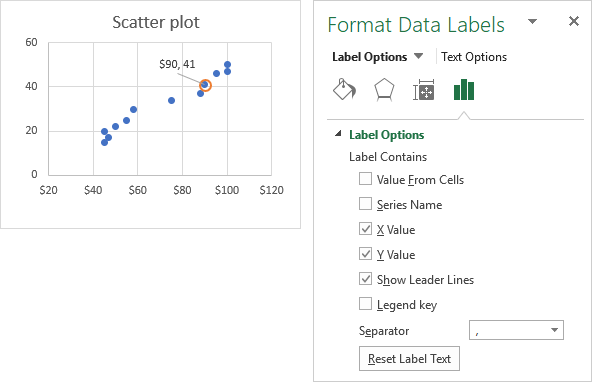 Select the Data Labels box and choose where to position the label. If you want to show only the name of the month on the label, clear the X Value and Y Value boxes. 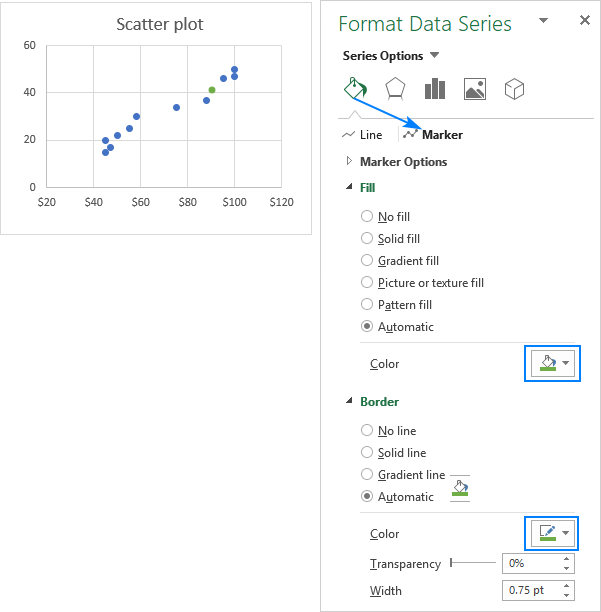 Select the target data point in a chart. 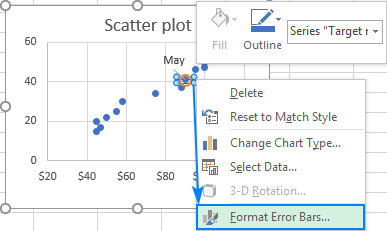 Click the Chart Elements button > Error Bars > Percentage. Right-click on the horizontal error bar and choose Format Error Bars… from the pop-up menu. Right-click on the vertical error bar and do the same customization. The same technique can also be used to highlight the average, benchmark, smallest (minimum) or highest (maximum) point on a scatter diagram. 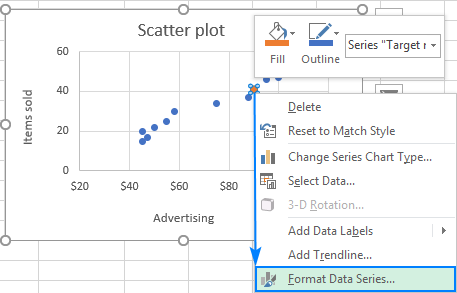 That's how you can spot and highlight a certain data point on a scatter diagram. 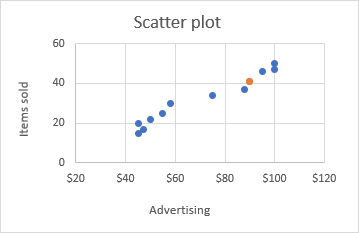 To have a closer look at our examples, you are welcome to download our sample Excel Scatter Plot workbook. I thank you for reading and hope to see you on our blog next week. 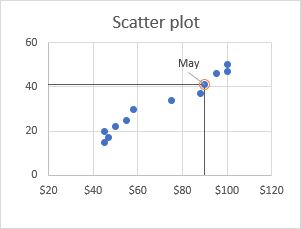 2 Responses to "How to find, highlight and label a data point in Excel scatter plot"
I created a chart in excel with multiple lines. I have added the legend. I would like to know how I can add the latest data point of each series to its legend, i.e. in the legend box, not to the lines of the chart. Can you help? 2. In the 'Select Data Source' box, click on the legend entry that you want to change, and then click the Edit button. 3. The 'Edit Series dialog' window will show up. The 'Series name' box - it's where Excel takes the label for the selected legend entry. You can either type the desired text in that box, e.g. ="Apples 10", or you can add a reference to the cell that contains the latest data point (click in the box, and then click the cell). 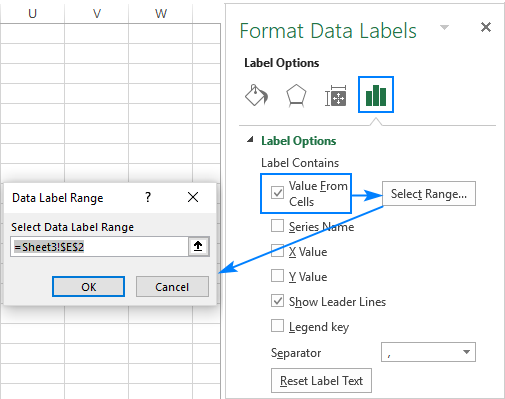 If you add a cell reference, the legend label will updated automatically as soon as you change the corresponding value in the source table. 4. Click OK twice to close both dialog windows.